Today we are launching the feature that really reveals the real power of PressBooks: our CSS editor. 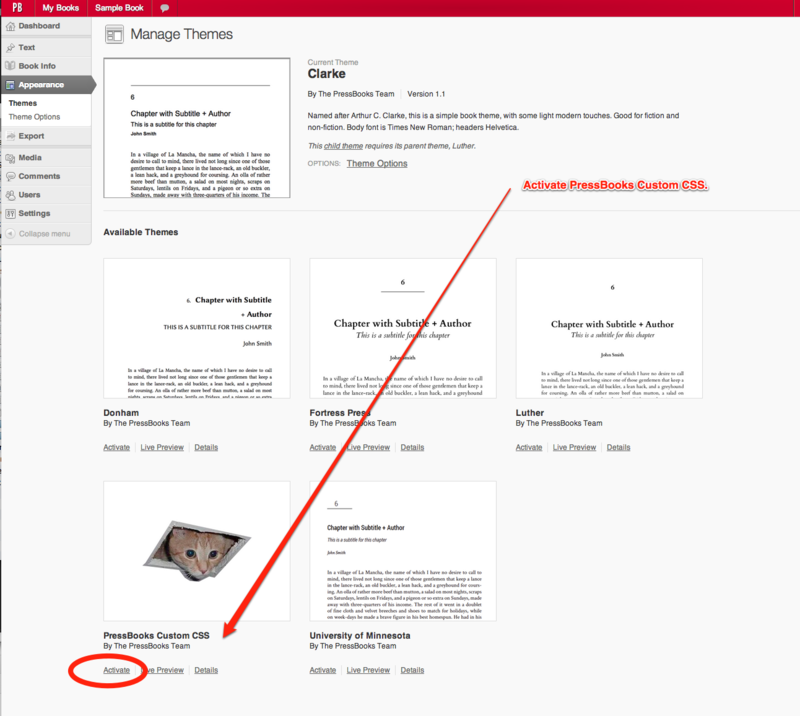 In this post I’m going to tell you why this is exciting, and give a quick tutorial about how to use the new PressBooks CSS editor. (Caveat: it’s not completely polished… please give us feedback). CSS, or Cascading Style Sheets, make up a core idea of how the modern web works: webpages are rendered in HTML, the “content” layer that tells you what is on a page; CSS is the “display” layer that tells you what the page should look like. This is familiar to anyone who has spent a bit of time on blogging platforms. 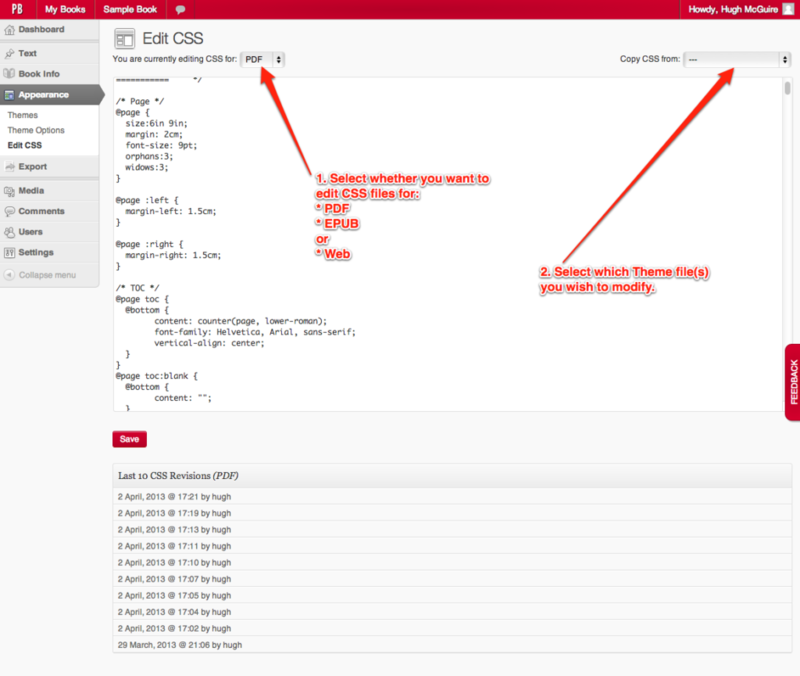 Different themes on your WordPress or Tumblr blogs look different (mostly) because of CSS. If you are a professional or semi-professional builder of ebooks, you similarly know about CSS. PressBooks ebooks look the way they do because of CSS. 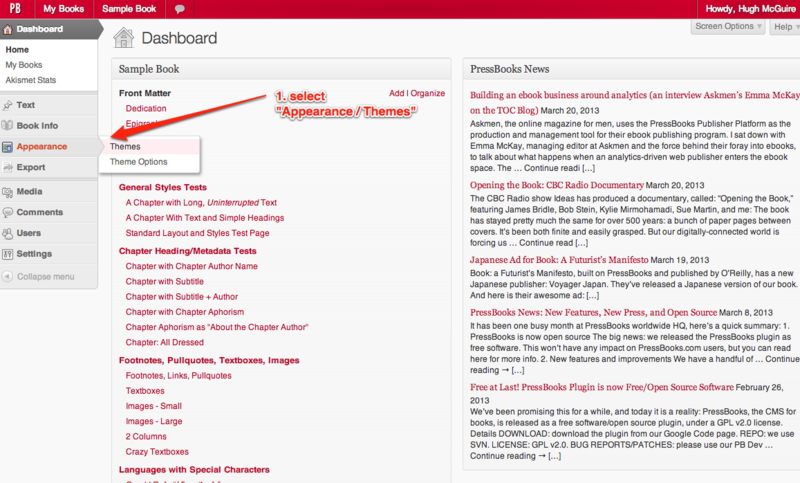 And the PressBooks webbooks use CSS as well. What about print? 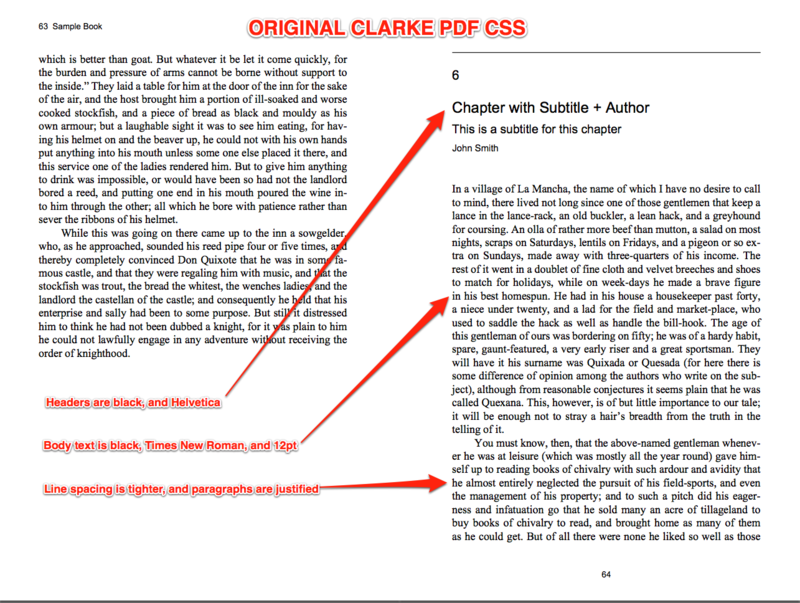 CSS to Make PDFs? Now I’ve Seen Everything! The exciting thing for us is: PDF. Our PDF rendering engine (Prince) uses HTML + CSS to produce PDF outputs. We’ve been using this internally to produce the templates you find on PressBooks.com, and for clients: we absolutely love it. 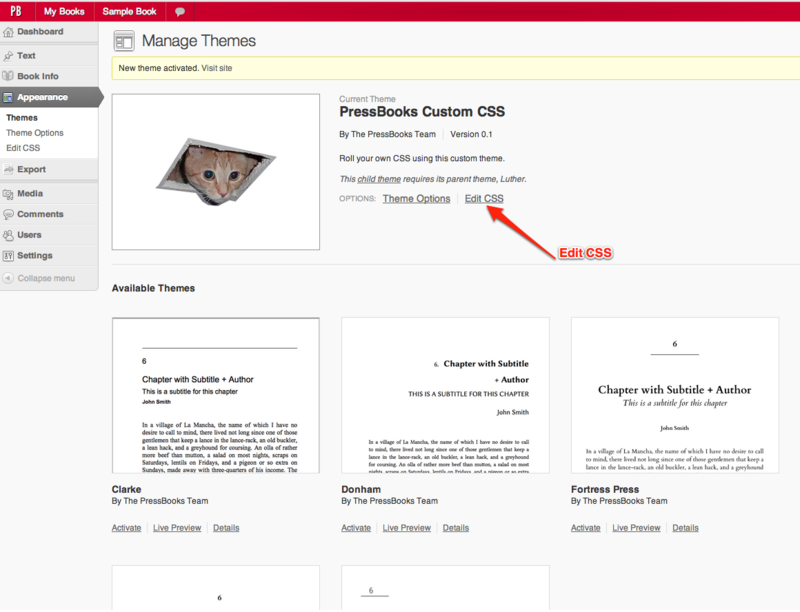 Today, we are rolling out the first cut of our interface for editing PDF, ebook, and web CSS in PressBooks. It will be improving, but below I’ll go over how it works, and show you an example of how to use the editor in practice. a. 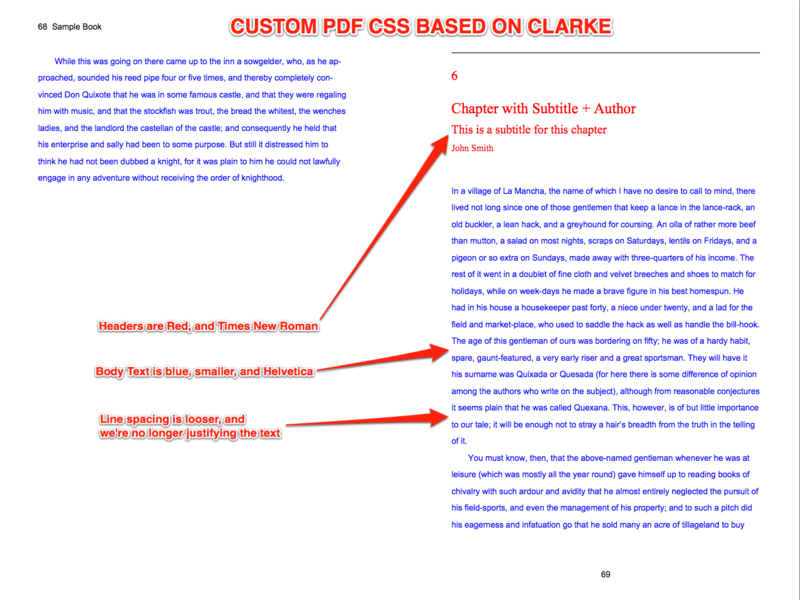 Select which output CSS you want to edit: Ebook, Web or PDF. Step 5: Edit your CSS! What about Ebooks and Webbooks? We believe that modern web design technologies (HTML+CSS) is the way of the future for “book design.” This is already the case in ebooks, and, of course is what underpins the web. By launching this new featureset in PressBooks, we hope to help bring HTML+CSS to print design as well. Far from signalling the death of book design, we think that customizable templates in general, and HTML+CSS in particular, will bring in a flourishing of book design activity — just as customizable templates, HTML+CSS have resulted in an explosion of great design activity on the web. This new feature in PressBooks is in alpha/beta testing stage, and we expect to make improvements in the coming weeks and months. Please contact us with bug reports, problems, suggestions and other feedback.